All Oil & Vinegars are 375ml bottles. Our Blackberry Balsamic Vinegar has a sweet, fruity, berry flavor. Most fruity balsamics are versatile since they compliment and pair well with mixed salads, fruits, chocolates, and as a marinade. Drizzle it on your favorite desserts, fruit salads, or cheese plates. Add a splash to your favorite iced tea or lemonade for a tasty fruit twist. 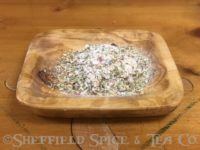 Use as a marinade or for finishing for pork tenderloin and chicken dishes. Brush some on your ribs near being done so it has time to add a delicious flavor, but not burn because of the natural sugars in balsamics. Make a salad of Baby Spinach, Mixed Greens, Candied or Toasted Walnuts or Pecans, fresh Raspberries, Blueberries, Blackberries or other berries of your choice. Crumble in some goat or feta cheese. You also add pear pieces or thin Granny Smith Apple slices. Then toss lightly with the Blackberry Balsamic Vinegar for a fresh flavor. For another Blackberry Balsamic Vinegar dressing, combine with our House Extra Virgin Olive Oil to make an unforgettable vinaigrette! Add a bit of Dijon mustard to add a classic French touch. You can add a touch of fresh or dried herbs like thyme, to the vinegar for a quick Blackberry Herb Dressing. There are many fruit balsamic vinegar dressings out there which work very well with our Blackberry Balsamic. The uses are endless. 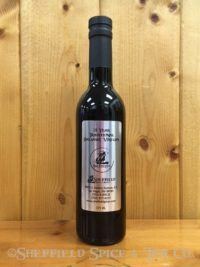 We carry other Balsamic Vinegars. To see what we currently have, please click HERE. We also carry Olive Oils. To see what we currently have, please click HERE. Ingredients: Balsamic Vinegar of Modena contains traces of sulfites, Acidity 6%, and Natural Flavors. Nutrition Facts: Serving Size 1 tbsp, Servings Per Container 25, Amounts Per Serving Calories 36, Calories From Fat 0, % Daily Value, Total Fat Og 0%, Saturated Fat Og 0%, Trans Fat Og, Cholesterol Om. 0%, Sodium 2m. 0%, Total Carbohydrates 8g 1%, Dietary Fiber Og 0%, Sugars 7g, Protein Og. Contains naturally occurring sulfites from raw materials. Processed in a facility where nuts, soy, eggs and milk are processed.